"My sister nicknamed me 'spintz' years ago for some unknown reason. When I invented this cake, she named it after me. 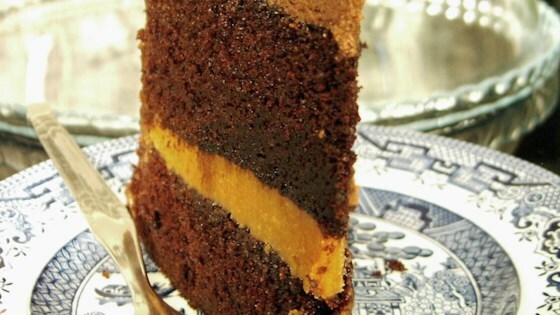 It is very rich - moist chocolate, creamy peanut butter filling and fudge frosting." Preheat oven to 350 degrees F (175 degrees C), and grease and flour two 9 inch round pans. Sift together the flour, baking soda, baking powder, 1/2 teaspoon salt, and 3/4 cup cocoa. In a large bowl, mix together the white sugar, oil, and 2 eggs. Add the milk and 2 1/2 teaspoons vanilla; mix well. Mix in the sifted ingredients, and then add the hot coffee. Pour the thin batter into the pans. Bake for 30 minutes. Remove the pans from the oven. Cover immediately with a piece of foil, and then a towel. Cool for 10 minutes. Remove the cakes from the pan. Place on a wire rack, and cover again with the foil and towel (the steam created by covering makes these cakes extra moist). Cool completely. To Make Filling: In a small bowl, cream the peanut butter, 1/4 cup plus 2 tablespoons confectioners' sugar, and 1 teaspoon butter or margarine. Beat well. Stir in 3 tablespoons cream and 2 teaspoons vanilla. Set filling aside until cakes cool. To Make Frosting: In a mixing bowl, combine 4 cups confectioners' sugar, 4 tablespoons butter or margarine, 1/3 cup plus 2 tablespoons cocoa, egg white, 2 teaspoons vanilla, pinch of salt, and 5 tablespoons cream. Beat with mixer on high until frosting is very creamy, about 2 minutes. Fill and frost the cooled cake. I make this cake ALL the time...it is always a big hit. The only change i have made, is i make it a 3 layer cake rather than a 2, and i double the recipe for the filling. This was just ok for me. Read all the reviews & was super excited but found it a bit dry & just a "good" cake.